The trailer for Maze Runner 3: Death Cure is finally here after a serious on set injury and multiple setbacks. The studio delayed the third installment until February of 2018 and has since brought the release date up a month to January 26th, 2018, which is only 4 months away. Some photos from the production were recently released and they were the first real look at Death Cure that we had seen up until now and they teased a pretty bleak, dystopian atmosphere with hints of a Mad Max theme and the first trailer offers an even more in depth look at what we're going to see in January. The trailer comes to us via https://www.youtube.com/watch?v=S_9OSktlm6s|20th Century Fox YouTube, and it looks just as dark as you can imagine. Thankfully, the first look at the movie doesn't spoil anything about the plot, but we do know that movie is expected to hark back to the first movie in an effort to bring the trilogy full-circle for the final installment. Dylan O'Brien is back as Thomas and he's leading the charge in the giant rescue mission. The official synopsis for Maze Runner: Death Cure reads. "In the epic finale to The Maze Runner saga, Thomas leads his group of escaped Gladers on their final and most dangerous mission yet. To save their friends, they must break into the legendary Last City, a WCKD-controlled labyrinth that may turn out to be the deadliest maze of all. Anyone who makes it out alive will get answers to the questions the Gladers have been asking since they first arrived in the maze." The Maze Runner is a series of young adult fiction set in a post-apocalyptic dystopian society. The books have sold over ten million copies worldwide and are New York Times Best Sellers and are very popular amongst teenagers and adults. In addition to the trilogy, there are also two prequels that set up the series. The trilogy was picked up by Fox in 2011 and includes the Maze Runner and the Maze Runner: Scorch Trials that have collectively gone on to earn over $660 million worldwide. Maze Runner: Death Cure is set to be released on January 26th, 2018 and is already highly anticipated because of the initial delay. But fans are just happy to know that star Dylan O'Brien is 100% back and the movie is in the final stages of post-production. The cast and crew of the movie have since grown a lot closer since O'Brien's accident and they gave him a lot of support and encouragement to get back to health in addition to the cast growing up and maturing together. Excitement is high for this one, but we only have to wait 4 more months to finally see it. Maze Runner: Death Cure is the third installment of the Maze Runner franchise, directed by Wes Ball. The movie is based on the third and final book in the Maze Runner trilogy, which was written by James Dashner. Death Cure was supposed to be released in February 2017, but it was delayed for a year when O'Brien suffered a serious injury on set. 25-year old O'Brien was on a harness on top of a moving vehicle that unexpectedly collided with another vehicle. 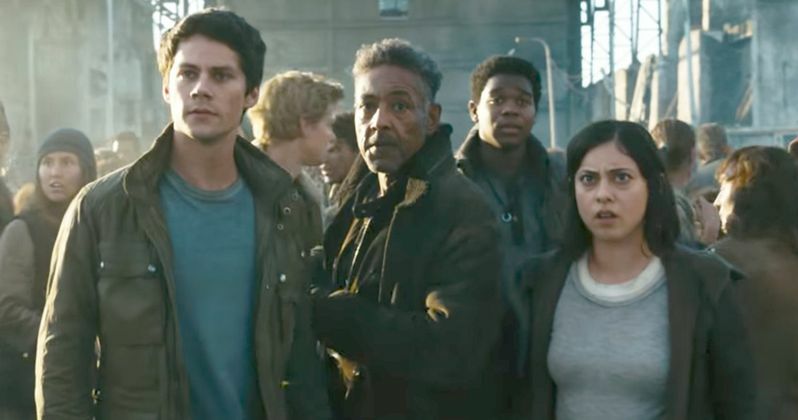 He suffered a concussion as well as facial fractures and lacerations, but is back and ready for the daring rescue mission through WCKD-controlled labyrinth as the trailer proves.